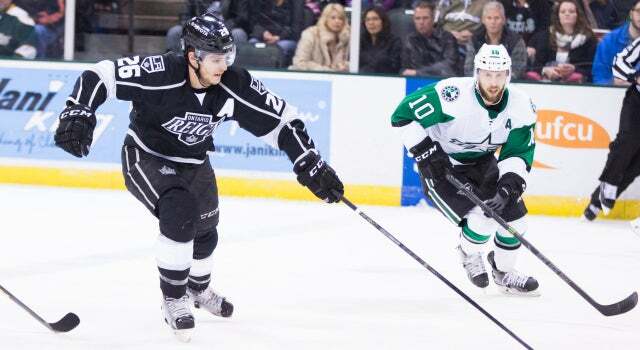 Vincent LoVerde scored early in the first period and buried the game-winning goal in overtime to send the Ontario Reign (31-14-3-1) over the Texas Stars (32-19-4-3) 3-2 at Cedar Park Center Friday night. The Stars opened the scoring early in the contest as forward Derek Hulak slipped a shot past Reign netminder Peter Budaj (W, 21 saves on 23 shots) off a faceoff win at 1:11, but the Reign responded moments later as LoVerde placed an unassisted goal off a pair of skates and under the blocker of Stars goaltender Maxime Lagace (OTL, 48 saves on 51 shots) at 4:47. As the contest rolled along, the Reign continued to outshoot and out-chance the Stars, sending 18 shots on goal in the second period and 16 in the third. After several failed attempts and highlight-reel saves from Lagace, the Reign broke through with 33 seconds remaining in the third period when forward and former-Star Sean Backman buried a pass from Justin Auger past a sprawled-out Lagace. Forward Nic Dowd added the second assist. In the dying seconds, the Stars were awarded a power play and pulled Lagace for the extra attacker and forward Jason Dickenson forced overtime with five seconds to play. In the extra skate, Backman found LoVerde streaking across the blueline where he blasted a shot past the stick of Lagace at 2:25 to seal the victory for the Reign. Ontario finished the game 0-for-5 on the power play while the Stars went 1-for-6.